I did this walk on the 23rd September 2006. After driving down from London I parked in the large car park besides Sandling Station, which is free on Saturdays and Sundays and took 10:06 the train over to Dover station where I had finished the last stage of my walk along the Saxon Shore Way. A single ticket cost £4.10 and the journey took 20 minutes. If this seems familiar the cost and journey length were the same as when I took the train form Dover to Sandwich when I last walked the Saxon Shore Way and indeed it was the same train, the one I took from Sandling being the same service I took from Dover. Arriving at Dover Station it was half a mile of steep uphill walking towards the Drop Redoubt fort to rejoin the path of the Saxon Shore Way. The route continues along the North Military Road which leads into Centre Road and then turns right into Citadel Road. Here the path runs past the remains of a small early 12th century church built by the Knights Templar, photo 1. The path turns left onto a track that runs below the Western Heights but the shape of the hill prevented any views of the buildings on top. There were however fine views along the coast in the direction of Folkestone as the path begins to head down hill to cross the A20. Photo 2 shows Shakespeare's Cliff, which the path climbs up having taken an underpass under the busy A20 road. Climbing to the top of the cliff there were fine views back towards the Western Heights and also over Dover with the white cliffs in the background, photo 3. The steep climb seemed a world away from the long flat stretches of sea wall I had walked along besides the Swale Estuary near the start of the Saxon Shore Way. The next few miles was a pleasant walk along the cliff top, photo 4, the path following the edge of the cliffs off into the horizon. In places the path was lined by blackthorn bushes and blackberries all of which had a bumper crop of fruit. Continuing along the path passes Samphire Hoe, Photo 5, now a country park which was formed from the waste material excavated from the Channel Tunnel rail works, which was deposited at the foot of the cliffs. Photo 6 was taken looking back towards Dover from the cliffs above Samphire Hoe. Sadly the weather was quite hazy and this prevented any views across the English Channel over to France. While it was very pleasant walking over the chalk hills the proximity of the A20 also meant that for a couple of miles there was a fair amount of traffic noise coming up from the road. From Dover the Saxon Shore Way has been sharing its route with the North Down Way and on the cliffs just past Samphire Hoe I passed a North Downs Way marker showing a distance of 122 miles to the start of the walk at Farnham. As I am getting near to the end of the Saxon Shore Way I have been starting to think about what long distance path to do next. I will definitely be walking the North Down Way at some point but I think my next summer walk will start with the Wealdway from Gravesend. In the meantime I want to finish off the Capital Ring, ideal for the short days of the winter and start the Hertfordshire Way which is close to home. The cliffs between Dover and Folkestone had been heavily fortified during the second world war and photo 7 shows the remains of a small pillbox, one of many such structures that remain along the coast. The landscape of the cliff tops, high above the channel, at times seemed more reminiscent of Cornwall than the South Coast of Kent although it was not long before Folkestone came into view at the end of the high cliffs, photo 8. Above Abbots Cliff I passed a few plaques set into the ground describing the local flora and fauna, photo 9, part of a project called Flora Calcarea by artist Rob Kesseler for the chalk and channel way between Dover and Folkestone. A number of Kestrels were hovering about over the edge of the cliffs as I passed by. A little further along the coast I passed a large concrete structure, photo 10, set on the cliff top, with a smooth hollowed out surface facing the coast. This is a concrete acoustic mirror which were designed to focus the sounds of any incoming enemy aircraft to a listener in the days before radar made them redundant and aircraft were slow enough to be heard before they were seen. The path passes along the cliff top, above the area know as the Warren, photo 11, and continues on past the Battle of Britain memorial before leaving the coast and turning inland to follow the top of the chalk hills just before the town of Folkestone is reached, photo 12. The Cliff Top Cafe looked very inviting but I still had a fair amount of walking to do so headed on. 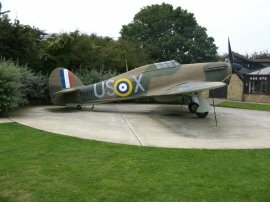 In September 2008 I walked the stretch of path between Dover and Tolsford Hill in the reverse direction as part of the North Downs Way and spent a bit more time looking around the site of the Battle of Britain Memorial, photo 7a-9a. The idea of a National Memorial came from Wing Commander Geoffrey Page, who had been shot down and badly burned as a Hurricane pilot during the Battle. 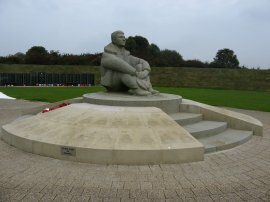 The Memorial, whose centrepiece is a sculpture of a seated airman looking out across the Strait of Dover, photo 7a, was unveiled by Her Majesty Queen Elizabeth the Queen Mother in July 1993. 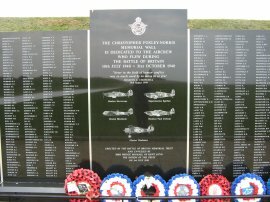 The National Memorial site today also features replicas of a Hurricane and a Spitfire, photo 8a, from the Battle, as well as the Christopher Foxley-Norris Memorial Wall (named in memory of a former Hurricane pilot who was first President of the Memorial Trust) which contains the names of all the airmen who fought in the Battle, photo 9a. There is also a small visitor centre at the site. The route of the Saxon Shore Way crosses the B2011 besides the Valiant Sailor pub and runs over open ground alongside Crete Road East. This was a busy road crossing on a bend and it might be best to head to the right past the pub for a bit before crossing the road. The sun came out for a short while and for a brief time there were good views over Folkestone and down the coast as far as Dungeness and its power station from the top of the hill. The path is now running along the Folkestone Downs, photo 13 and at odd intervals there was the occasional information board describing the history of the area. Photo 14 was taken looking along the route of the path which generally follows the edge of the high ground into the distance. The path joins the road and heads slightly downhill to cross the busy A260 Canterbury Road. This road was very busy and quite wide and not very enjoyable to cross! On the other side I stopped in a field to eat my sandwiches before heading back uphill towards Castle Hill. The massive earthworks on Castle Hill are the remains of a Norman ringwork and bailey castle, probably built in the 1140's. The famous landmark is one of the largest and most complete ringwork and bailey castles in the South East of England and is a scheduled ancient monument. Passing round the side of Castle Hill the rail lines of the Channel Tunnel rail terminal come in to view, photo 15, a classic example of the ancient and modern side by side. The earthworks of Castle Hill were quite difficult to photograph, photo 16, was taken looking back from above the rail terminal. The Saxon shore way continues heading inland along the top of the chalk cliffs. The path runs alongside Crete Road West between a hedge and woodland before heading over more open ground above the channel rail terminal with fields to the right and views of Folkestone to the left. The sound of the train engines providing a constant background hum. Eventually the path leaves the rail terminal behinds and head Northwards through an old chalk quarry. Across the green fields there were views over Summerhouse Hill and down the coast towards Dungeness which by now was once again hidden in the haze, photo 18. Many of the fields the path passed through at this point had Hawthorn Trees around them, covered in masses of berries that appeared to glow red in the afternoon sunshine, photo 19. Although it was towards the end of September it was another very warm day requiring neither fleece nor jacket and the sun felt particularly warm on my arms. Passing below Shearings Bungalow the Saxon Shore Way heads downhill off the top of the chalk, descending about 80 meters in height, photo 20. The path makes it way over a field and passes under a bridge that used to carry a railway line, photo 21. Having passed under the railway line the Saxon Shore Way then set about regaining all the height it had lost as the path gradually climbs up towards the radio mast at the top of Tolsford Hill, photo 22. Approaching the radio mast much of the surrounding land is owned by the Ministry of Defence and there were the occasional signs saying to keep to the path. Here, 12.5 miles after I had started out, the North Downs Way continues ahead while the Saxon Shore Way turns to the left, past the radio masts and on to the trig point on top of the hill at a height 181 meters, photo 23. The trees in the background are Brockmans Bushes. A little further round Summerhouse Hill could once again be seen in the distance, photo 24, this time from the West. Leaving Tolsford Hill the path head downhill once again along a very bumpy and rough lane, much churned up by traffic although fortunately it was very dry. At the foot of the hill the path crosses the A20 before running between fields to take a bridge over both the M20 motorway and the rail lines of the channel tunnel rail link. On my map there was a footpath marked as part of the Ealham Valley Way that ran alongside the railway lines back to Sandling station however this appears to have been closed and I could see no path off the track I was on so I continued on along a track that led past a few houses and into Heane Wood. The path winds its way through the woodland before coming down to the Sandling Road from where it was about a half mile walk back to the station. Fortunately there was a pavement besides the road which made it easy walking. The GPS made this walk 14.6 miles, a good mix of coastal cliff walking and more inland fields and woodland. Some sections did suffer a bit from noise pollution though. I felt quite tired at the end of this walk, more so than I should have done given the distance walked. At the start of the year I had set myself the target of walking 360 miles this year which equated to three 10 mile walks or two 15 mile walks each month, a reasonable commitment with the family and of course football. At the end of this walk I have completed my target having now walked 372 miles.